The author, translator and subject of So Long, Marianne discuss this fascinating book. Marianne Ihlen was Canadian poet Leonard Cohen’s muse and lover. Richard Crouse moderates. Richard Crouse is a regular film critic for CTV’s Canada AM. He is also the author of six books on pop culture history and writes two weekly columns for Metro newspaper. Helle V. Goldman spent her childhood on the Greek island of Hydra and in Providence, Rhode Island. She resides with her husband and daughter on yet another island, this time in Norway—above the Arctic Circle—where she is the chief editor of an international scientific journal. She presents So Long, Marianne, which she translated into English from author Kari Hesthamar’s Norwegian. The book chronicles the story of Leonard Cohen’s lover and muse, Marianne Ihlen. Journalist Kari Hesthamar heads the radio features department of Norway’s National Broadcasting Company. Creating radio documentaries that are “films” for listeners’ ears, she has been awarded the Prix Italia and thrice the Prix Europa. Hesthamar presents So Long, Marianne, which, with never before seen photos, facsimiles and letters, documents the story of the woman who inspired and was immortalized in so many of Leonard Cohen’s songs and poems. The radio documentary that acted as the basis for this book won the Prix Europa in 2006. At 22, Marianne Ihlen travelled to the Greek island of Hydra with Norwegian writer Axel Jensen. While Axel wrote, Marianne kept house. One day while Marianne was shopping in a grocery store, a man asked her to join him and some friends at their table. He introduced himself as Leonard Cohen, then a little-known Canadian poet. When the erratic and explosive Axel abandoned Marianne and their newborn son for another woman, Leonard stepped in and a new, tender love affair began. Ihlen discusses So Long, Marianne by Kari Hesthamar, which documents her story. Leonard Cohen is currently considered a "single author." If one or more works are by a distinct, homonymous authors, go ahead and split the author. 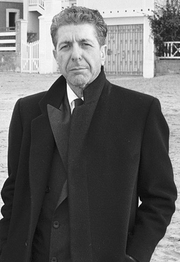 Leonard Cohen is composed of 7 names. You can examine and separate out names.